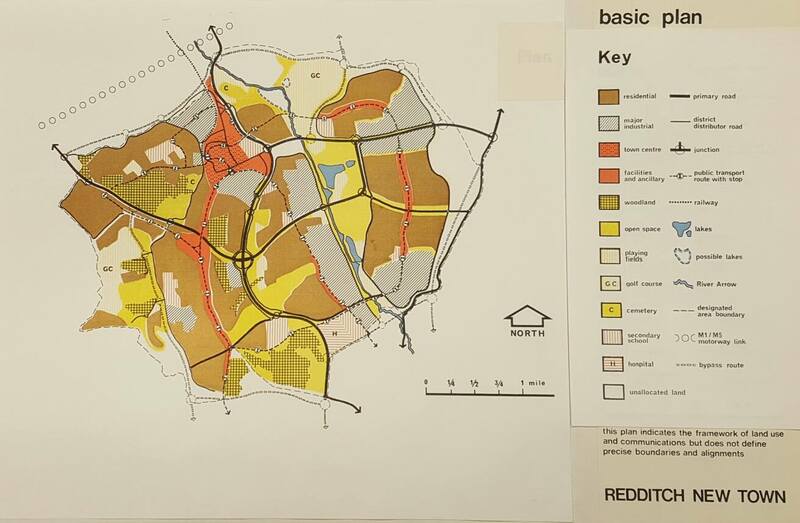 As followers of this blog will be aware, the Landscape Institute transferred its archive to MERL in October of last year and is currently supporting MERL financially to work on the Institute’s collections and make them accessible. As part of the terms of the transfer, it was agreed that a separate friends group should be established to support and advise either party when asked to do so. We held our inaugural meeting at MERL in February this year but chose the worst possible week to do so – a combination of flooding, high winds and travel disruption meant that some had to put off even attempting to travel to Reading while from others we received messages such as: ‘at the airport in Belfast, delayed by snow’; ‘the car broke down in Yorkshire’, ‘my apologies…heavily involved with flood issues…I serve on the Thames flood and coastal committee’. Despite the travel difficulties we still had a sufficient turnout to make the day a great success. Guy Baxter, the University’s Archivist, gave us a talk about work in progress and the mutual benefits derived from having our archive at Reading. 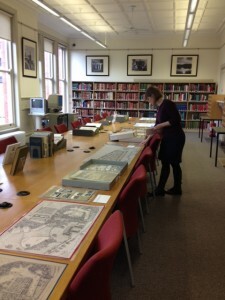 The MERL staff laid out a wonderful display in the MERL reading room of some choice items from the Institute’s archive. On the day a further important collection was brought to Reading. Hal Moggridge of Colvin and Moggridge donated the Brenda Colvin collection to the LI’s archive at MERL. 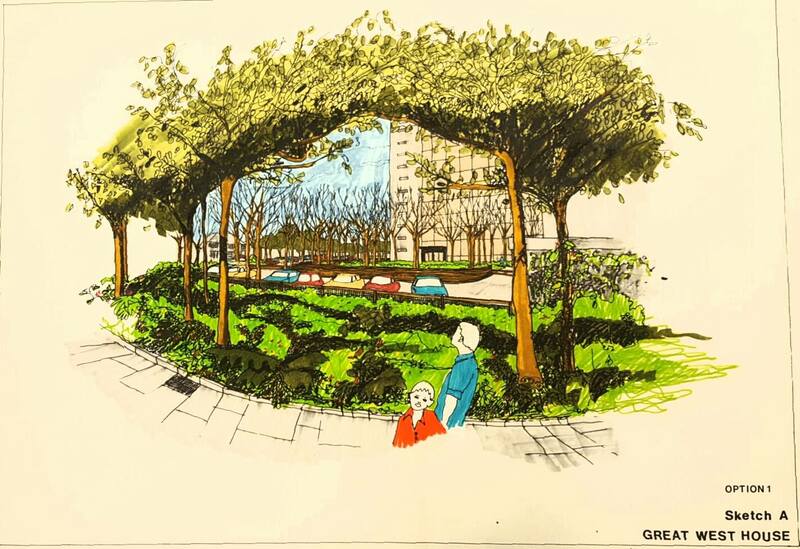 Brenda Colvin, who died in 1981, was a founder member of the Institute of Landscape Architects (as the Landscape Institute was then known) and elected its first female President in 1951. 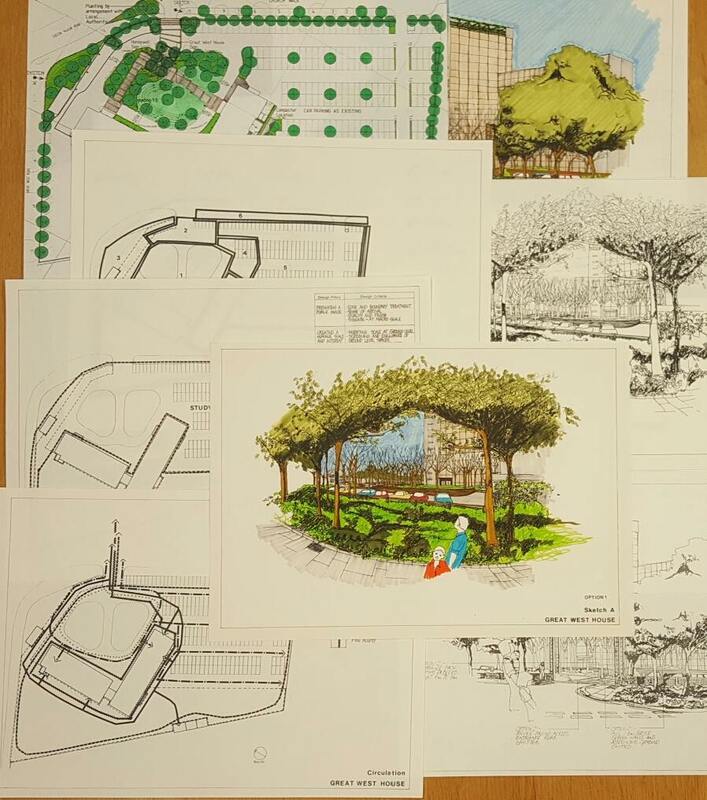 Currently, she is less well known by the general public than her contemporaries, Sylvia Crowe and Geoffrey Jellicoe, but her influence was just as great on a whole generation of landscape professionals. Her collection will be a wonderful additional source of primary material for researchers at MERL. MERL Curator, Isabel Hughes, understands the challenge. Recent census statistics show that about eight percent of the population of Reading comes from a black or minority ethnic (BAME) community. However, our visitor surveys, carried out as part of MERL’s Heritage Lottery Funded ‘Our Country Lives’ project, show far fewer local people from these backgrounds visit the Museum. In 2013 MERL had the opportunity to take on a Museum Trainee Fellow, Genell Watson, which was made possible with a bursary from the Arts Council England’s funded ‘Permeate’ scheme. As part of her programme of activity, Genell considered new ways of appealing to local people with a BAME background. Genell was asked to identify objects which held special significance and top of the list were the sewing machines in the Barnett Collection. She liked the sewing machines because her mother had one and used it to make clothes for the family, in Jamaica. Here was a common thread, but how could this be transformed into possible contact and outreach? Unlikely as it may seem, this is where I came in. I am a former MERL PhD student, and was recently awarded a Fellowship to compare the marketing strategies of Fowler steam ploughing engines and Singer sewing machines. I shared desk space with Genell under the eaves of the museum and it didn’t take long for us to discover a mutual interest in sewing. I’m a textile artist in my spare time. I dug out my coursework books of eye-catching samples to share with Genell, and an idea began to take shape for a quilt project. 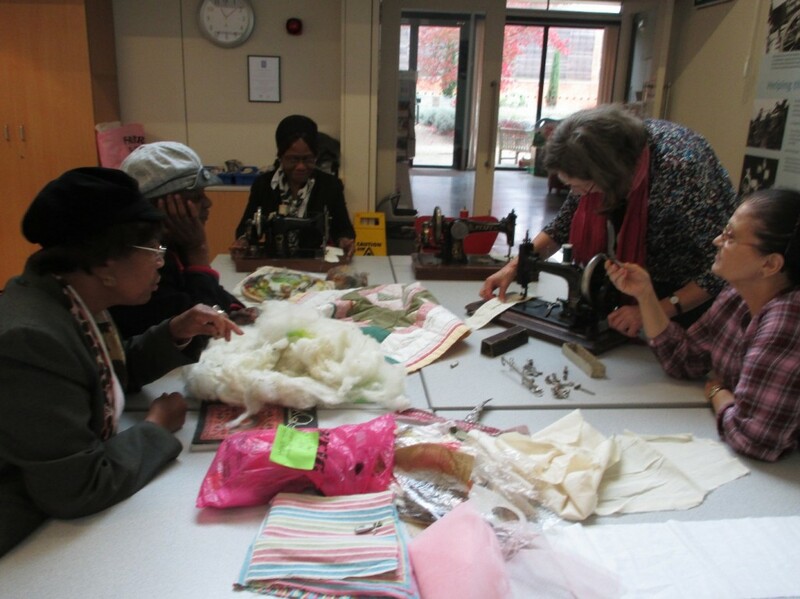 Genell knew local community groups, but would they visit MERL and take part in the project? There was only one way to find out. Over two very wet days in October 2013, the two of us went from local church hall to community centre – 17 in total, with a book of samples and a message, ‘Hello, we are from the University of Reading, Museum of English Rural Life, and would like your help.’ The response was incredulous, ‘What us?’ … but the invitation was received with great pleasure. 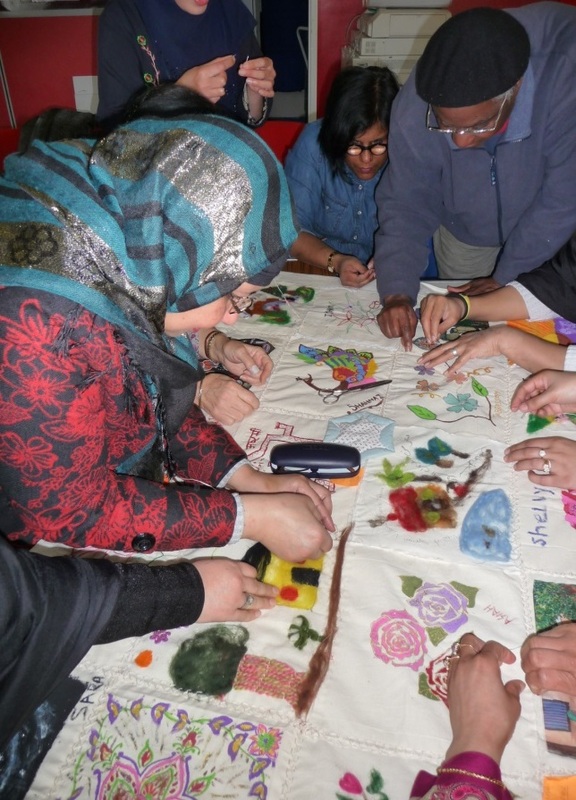 All of the groups said they would like to visit MERL in the future, and ladies from Slough Roots and the Aman Group volunteered to make our quilt. Reasons for not accepting the invitation at this time were that programme schedules were already full, groups lacked funding for transport to the Museum, and members might be nervous and so a follow-up visit was requested. We have made an application to the Ashley Family Foundation for future funding in the hope that we can work with more groups. Seven ladies from Slough Roots and the Aman Group, and their Co-ordinator, Cynthia Knight, visited MERL in November 2013 to see old quilts from the collections. Ready to greet them were three sewing machines from the Barnett Collection including a clone of Singer model 28, dating to the 1920s, made for the UK market by Mundlos and Co. of Magdeburg, Germany. Cheap German-made versions of Singer machines were commonplace, when the designs fell out of patent, and were often copied. This one was called a ‘Royal’. 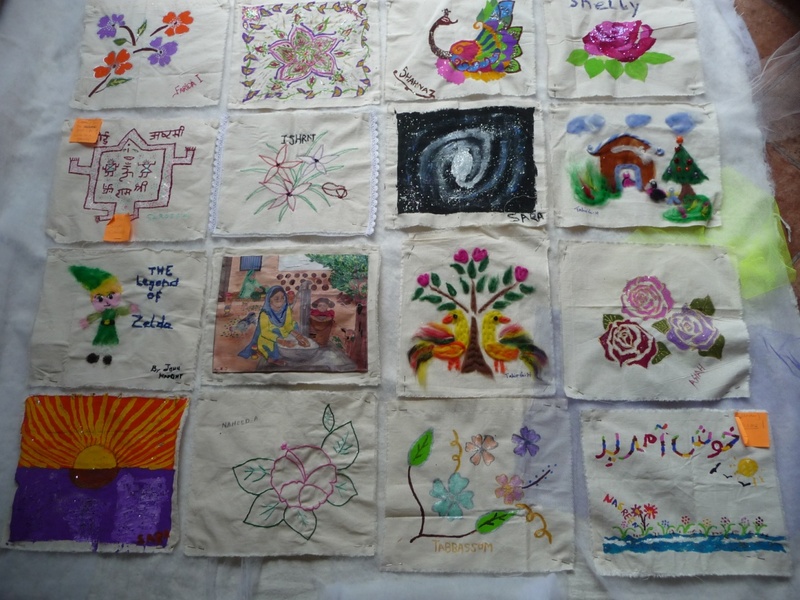 When all the quilt blocks had been assembled, a follow-up visit to Slough for a ‘Quilting Bee’ was made in March 2014. As more and more people stopped by to ‘join the party’, and put a stitch in the ‘Community Lives’ quilt, the noise level rose. The finished quilt will go on display at Slough Public Library on 19th May before returning to Reading to be hung in the Reading Room at MERL. There have been many studies exploring how children use a museum, including many looking into a parent and children’s interaction in a museum. This research is useful as the findings can be used by the museum itself to improve their services – such as through information packs or museum layout – so that their collections can become more effective for children. When we were planning our third year project, there was an option to carry out a project at MERL – no specific outline was set as to what would be carried out and so we had an initial meeting with a few of the staff from the museum, to come up with an idea that would incorporate both our requirements for our project, but also one that would benefit the museum in some way. After much discussion and working out what was achievable for us, we came up with a project looking at how children learn names of novel objects, and whether words and/or pictures would aid this learning or not. This links to our studies about a child’s word learning and will also benefit the museum and help their plans for their redevelopment. Hopefully, the museum will be able to use our findings to develop useful resources for children to use when visiting the museum. Following the generation of this idea, we came up with a standardised procedure that we could use to test a child’s word learning. We then chose 10 novel objects that we could teach a child the names of – we had to ensure that the children would not know the names of these objects prior to this study. 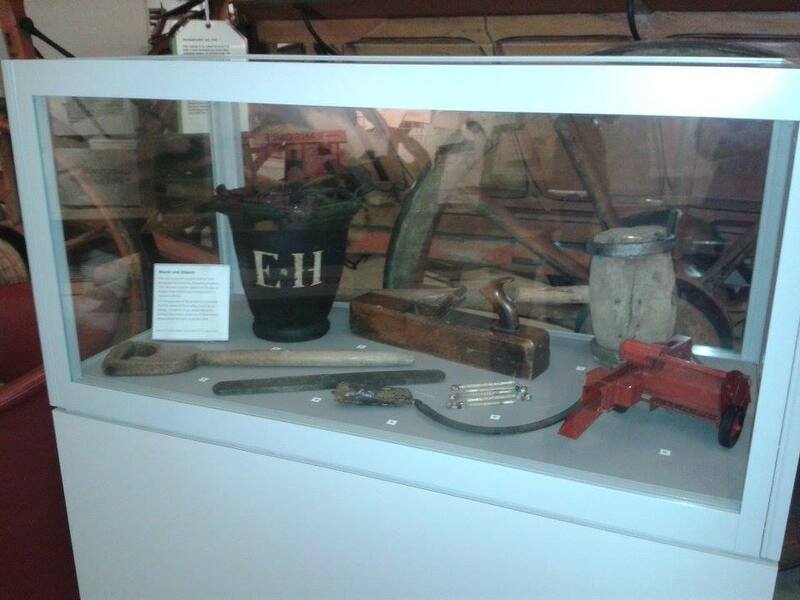 These were then placed in a case in the museum (seen in the picture) for use during the research. Information cards containing words and/or pictures of these objects were then prepared and then the research could start! We carried out a pilot study in the museum on Apple Day, and started our actual research after a few alterations in October half term so that we could carry out the research on children of our target age as they visited. Our next steps are to collate all of the data we collected over the week in the museum and see if we found any significant results. Hopefully our findings will be useful and able to inform the museum on how to usefully interpret their collections for this age of audience during their potential redevelopment next year! We look forward to sharing our results in due course. In this month’s guest post, Professor Alison Donnell kindly provides us with details of an exciting new development at Reading. We have a new collections-based research programme! 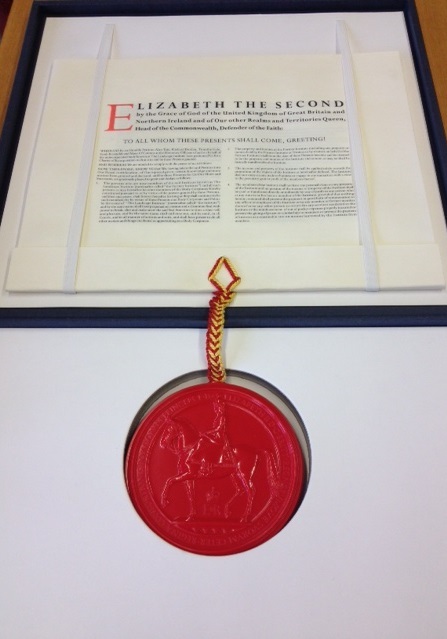 This allows PhD students to undertake research with University of Reading collections and get specialised training. 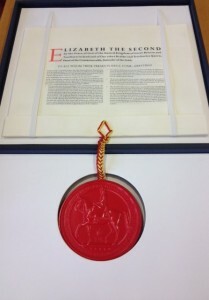 Two of these studentships connect with MERL and special collections, but the opportunity to apply for these two exciting scholarship opportunities ends 31 July. Spread the word! Both studentships cover fees for the duration of the PhD and offer an additional payment of £3000 for the first year and £1000 per annum for the next two years (part-time options also available). A PhD around the topic of ‘Changes in farm business structure in England, 1936-56’ entails working with records at The Museum of English Rural Life (MERL), the foremost repository for English agricultural and rural history archival material. The project will study agricultural and farm business change over 1936-56, a period of rapid and fundamental developments in the industry affecting not just the resource base, but methods of production and consumer demand. The approach taken could be historical, economic, behavioural or sociological. However, as the database lends itself to the use of GIS techniques, geographers could also find it useful as could those interested in environmental change at the regional level. ‘Animating the Evacuee Archive: Memory and Materiality’ offers an opportunity for practice-led doctoral research around the largest evacuee archive in the UK. 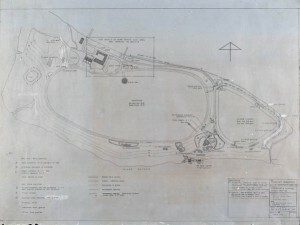 The archive contains a wealth of autobiographical documentation produced by a range of socially and culturally diverse Second World War child evacuees from the UK to a variety of national and international destinations, including – via the Children’s Overseas Reception Board (CORB) – South Africa, New Zealand, Australia and Canada. The available documentation includes written testimonies, diaries, letters, photographs, film and audio recordings, and a variety of ephemera, such as, for example, ships’ menus. We invite applications from appropriately qualified candidates in any relevant discipline, including theatre, museum studies, history, performance, film and media studies. You should have an interest in socio-political histories and their documentation. The project framework proposes practice-led doctoral research that will engage with, intervene in and animate aspects of this archive within a range of publicly accessible spaces, thus shaping and re-routing it via a hybridized range of potentially interactive events. The critical frameworks and practical outcomes of the PhD research will be informed by, and interlock with, an important new cross-institutional project funded by the Arts Council, in which the supervisors are involved. There is also a placement opportunity in a museum setting.